A guest post by Leslie McKee, my colleague and blogger at www.getorganizedpittsburgh.com. Everything gets better with delegation. Some people struggle with delegation because they feel that they are imposing or asking for help. I am a natural delegator. I see it as a form of collaboration. My immediate response to a new task or project is to break it into smaller, more do-able parts. When I am doing that, I’m immediately thinking about how I can incorporate other people’s skills and insights. Bringing other people in automatically makes it more social, fun and adds accountability. I find that people are flattered to be considered an expert or simply recognized for what they do well. In business, as an organizer I realized early on that I simply could not organize Pittsburgh single handedly, but I could definitely be a resource to help! Finding resources is one way to delegate. In that process relationships are often built. I always just ask, even when I know it might not be a great fit, because it often leads me closer to answers and progress. It also opens the doors for people to ask me for help as well. 2. Consider who might help you. 3. Consider why they might want to help you. 4. Decide what parameters you need to put in place. Try to find areas where you are a natural delegator and where it works in your life. Then see if you can add that to more areas. You will usually feel more supported, find yourself doing more of what you do best and create a life that comes together nicely. I am a lover of learning and an eternal student. I love everything to do with school! I was grateful, humbled and excited about the opportunity to be principal for a day at our local elementary. The day started with the magical words, “Mrs. Delap is here for Principal for a Day”. And off we go to visit kindergarten, 1st, and 2nd grade classrooms, learning labs and more. What I learned was beyond my most magical thoughts! As a former kindergarten teacher, I come with my biases. Play fair, be kind, work hard and listen carefully are all my inborn mantras. Imagine a school where communication and high expectations are part of the culture. Technology is there assisting with all sorts of learning, whether it is visual, auditory or kinesthetic modalities. Parents come to help in each classroom, feeling welcome and a part of the learning process. This is what I saw during the day. Kids were involved, learning, and doing. They were immersed in language and math. Teachers are individualizing education on both ends of the spectrum. Not only are there gifted programs, but the school houses a special unit of Severe Communication Disorder programs for autistic students. Teachers partner and plan as groups, adding their own flavor in their own classrooms. Everyone comes together with their strengths to make this school exemplary. When asked what parents can to do best assist their kids in school preparation and success, the staff and principal mentioned learning social skills, organizational skills and study skills are the highest priorities. Our school promotes a culture of caring, getting along, organizing your paper and time, and studying effectively. Each month the scohol hosts a Coffee Talk about school success. Of course there will always be challenges in our school, especially with funding. This elementary sponsors many fundraisers. My small gift to them was a gift certificate for an upcoming school silent auction. Thank you Humble ISD Foundation for the opportunity to be a part of our thriving and vibrant education system. And yes, I did promise the teachers a raise and give the kids a half day of school! It was one of the best days ever to be an educator! We live in a crazy world! Difficult times come and go and we need ways to handle the stress. Learning to navigate these tough periods can make all the difference. Being resilient means we bend and bounce back. Some people are naturally more resilient, but we can learn behaviors that help too! Be optimistic. Having a sunny outlook helps us manage a crisis between. Create a habit of positive, half full glass thinking by being grateful and appreciative of what you have. Be spiritual. With a strong belief and a faith family connection, you are better equipt. Be playful. Enjoying experiences, finding goofy fun at tough times, and laughing are all ways to get through a tough time. Be gracious. Be organized enough to be thoughtful of others. Give back. The benefit of nurturing others is great. Find a cause you are passionate about and commit to participating in it. Stay connected. Resiliency depends on relying on others too! We need partners to match our strengths and weaknesses. Recruit resources to help you move forward in all you are doing. We are all learning resiliency in our current times. What steps are you taking ? We are continuing to live in tight money times. But even if not, being mindful of how we use our resources is always important. Money and finances mean many things to people. Depending on our background, we may have experienced scarcity or prosperity. We may view money as “to be spread around like manure” (thank you Hello Dolly!) or for only the most important of needs. Getting organized about money is the first step. Organization with your money is the first step to realizing your financial goals. Do you want to purchase a home, send your kids to college or retire early? Having a working knowledge of your finances makes these goals attainable. Be empowered by organizing your money with systems and routines that work for you. This all takes time, our most valuable resource, however organizing your money is well worth the investment. 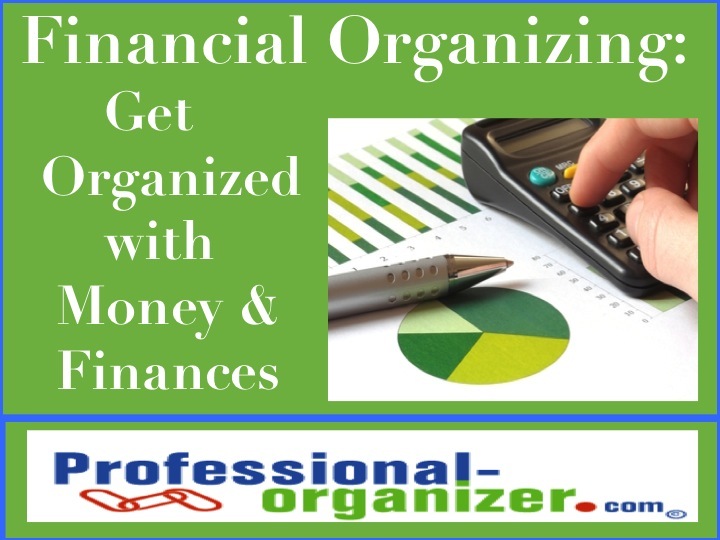 Financial organizing takes a little extra time but is well worth it. As in all organizing, you want to be able to find what you have! Having just one checking account is the way to know how and where you are spending it! Having one credit card not only simplifies paying the bill during the month, it also makes you most aware of where your money is going. If you are a small business owner, you should also have one credit card and one checking account for your company. Simplifying our connection to money can make all the difference. . Writing down how and where you spend money is an enlightening experience! Just like those food logs that scare us into a lifestyle diet change, we can do the same for money. Keep a log of EACH item you purchase in a month. Not only will you realistically know what things cost to create a realistic budget, you will also know just how many times you are using money for “wants” rather than “needs”. Ledgers can make the difference for us in keeping track of and being accountable about our funds. Use your check register all the time to record checks and debit card transactions as these occur. For bill paying, keep a ledger to record your payments to utilities, credit cards and other monthly expenses. This way you see what each bill is each month, compare the expenses of the bill each month, and be sure you paid it each month. Seeing it on paper makes money not only a currency traded, but an effective way to see what we are really about. You can also use Quicken to record the payments to see annually what your expenses are and to help balance your checking account each month. Through out the year, donations and expenses are occurring related to taxes. Before tax season, you’ll start to receive tax related information from your job, your bank, etc. Keep all of these tax-related papers in a labeled file folder. This way, when you’re ready to do your taxes, you won’t have to search for the papers you need. You hear it all the time: “pay yourself first!” Set up an automatic payment from you to your savings account. It is the most painless way to get ahead on your savings. Having trouble paying your bills on time? Set up automated payments to get this done timely. You can use auto debit from your bank account or http://www.paytrust.com/. You will still need to keep up to date on what is being paid and to whom, but the process can make a difference in getting the job done. Finish bill paying by filing all receipts into an easy access file or notebook. What works for you on making money count? 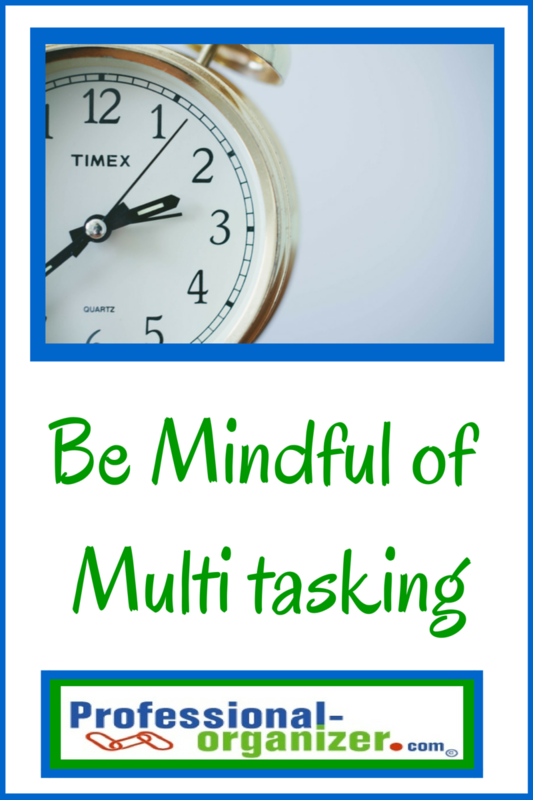 Lots of new multi-tasking statistics are bringing into focus this productivity concept. Studies have shown that each time someone makes a “task switch,” or multitasks, their productivity is actually reduced by 20 to 40 percent. While previously thought to be a great tool, now multitasking is glaringly not so! Mindfully focus on one task at a time. Start by prioritizing to be sure this task takes highest importance. Purposefully stay on task by creating a “power period”, a 45 minute time you work on a single project. Successfully working on one project makes you feel accomplishment, lowers your stress and lessens the load of the total projects. Eliminate distractions by creating an effective environment. Turn of the computer, stop texting, and turn off the tv. Really give yourself the opportunity for undistracted work. If a call comes, use your technology to the fullest and let it go to voice mail. Create your optimal environment with soft music, scent in the room, and a clear desk. A clear desk invites creativity, productivity and efficiency. Make phone connections and relationships count. During a call, be sure to be “on the call” not just on the phone. We are always trying to do one more thing while talking. Make that person and the call more important than the distractions. Are there positive uses of multitasking? Double time two low priority tasks and get them done! This includes pairing folding the laundry or putting away dishes with background television or having administrative time while listening to music. These little incentives can help you finish up a less than interesting task. What are your favorite ways to get just that one thing done?